Mawnin' Loverlies! 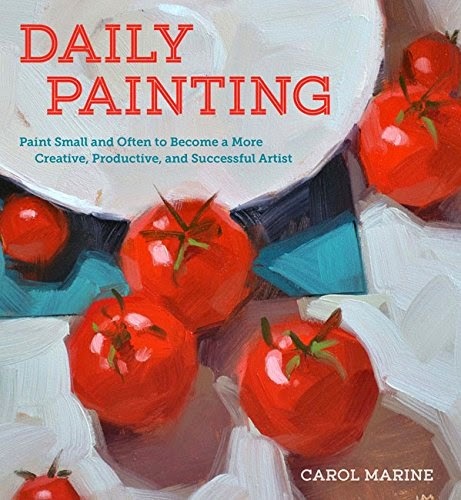 I recently received a book from Blogging For Books called Daily Painting: Paint Small and Often to Become a More Creative, Productive, and Successful Artist written by Carol Marine. In the beginning of this book Marine talks about she got into selling her paintings and entering them into galleries. In this book she explains the benefits of blogging and selling online, and painting often and small. Marine also explains what materials she uses, how to place your still life objects correctly before painting them, and Marine also has quite a few paintings where she shows what she did step by step. This book is a great book for an artist that is first getting started, because it has so many tips and information that will help. This book mainly talks about oil painting, but you can use this information with any type of paints. Go HERE if you are wanting to purchase the book. Have a Blessed Day! ABOUT THE AUTHOR: CAROL MARINE is an artist and the creator of the popular blog A Painting a Day (or Almost). She is a member of Daily Paintworks, a distinguished group of daily painters, and she teaches daily painting workshops around the country. Marine lives in Eugene, Oregon. Visit www.dailypaintworks.com.